The Magic of Olives: Packed with Phytonutrients, Antioxidants and Good Fats! 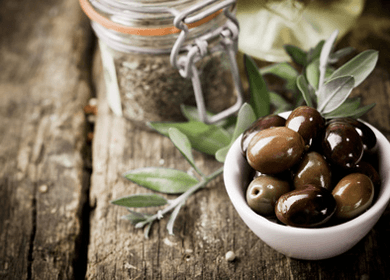 A popular food for thousands of years, olives pack a powerful nutritional punch along with their rich flavor. One of the oldest cultivated trees, the olive tree, along with its branches, fruit, and oil–permeates legend, history, and palates around the world. A universal symbol of peace, glory, and abundance, the olive, native to Asia Minor, was first cultivated in the Mediterranean during the fifth century BC. According to mythology, Zeus promised to name the region of Attica that contained what would become the city of Athens for the god or goddess who brought the most useful invention. Poseidon brought a warhorse and Athena brought the olive tree, useful for heat, light, shade, food and medicine. Legend has it that the olive tree that grows at the Acropolis in Athens comes from those first roots. Olives are the fruit of the Olea europea tree. There are thousands of cultivars, but only a few are grown abundantly, both for olives and olive oil. A few important cultivars are arbequina, bosana, kalamata, manzanilla, and mission. Some olives may be eaten right from the tree, but most sold commercially are cured with water, brine, or lye. Regardless of variety and processing, olives are high in healthy, cholesterol-lowering monounsaturated fats and are rich in many health-protective nutrients, including an array of antioxidants. A one-cup serving packs 22 percent DV (percent Daily Value, recommended intake for 2,000 calories/day) of iron, 16 percent DV for dietary fiber, and 20 percent DV for copper for 148 calories. Most of the olive’s fat is made up of oleic acid, a monounsaturated fat associated with reduced risk of heart disease. Olives are also plump with a diverse collection of phytonutrients, including polyphenols–known antioxidants which protect against cell damage. A study published this year in the Journal of Alzheimer’s Disease found daily consumption of oil from olives as part of a Mediterranean style diet may protect against age-related cognitive decline or Alzheimer’s disease. A laboratory study published in a 2011 issue of the Journal of Agricultural Food Chemistry found that olive skins contain important antioxidants that inhibit breast cancer cell growth. Whether canned, jarred, or in an olive bar, olives are fun to explore. Sample the variety of greens, blacks, reds, sizes and textures–smooth, wrinkled, or cracked. Some are even stuffed with peppers or nuts and swimming with herbs and spices. Olives make a simple snack or appetizer on their own, or blended with olive oil, garlic and seasonings as tapenade to spread on bread or top fish and poultry. Reprinted with permission from Environmental Nutrition, a monthly publication of Belvoir Media Group, LLC. 800-829-5384. www.EnvironmentalNutrition.com. (c) 2012 BELVOIR MEDIA GROUP DISTRIBUTED BY TRIBUNE MEDIA SERVICES, INC.
Hey Buddy!, I found this information for you: "The Magic of Olives: Packed with Phytonutrients, Antioxidants and Good Fats!". Here is the website link: https://www.thealternativedaily.com/the-magic-of-olives-packed-with-phytonutrients-antioxidants-and-good-fats/. Thank you.